Moving averages are one of the most commonly used technical indicators in the forex market. They have become a staple part of many trading strategies because they’re simple to use and apply. While they’ve been around for a long time, their ability to be easily measured, tested and applied makes them an ideal foundation for modern trading strategies which can incorporate both technical and fundamental analysis. Both SMA and EMA are averages of a particular amount of data over a predetermined period of time. While Simple Moving Averages aren’t weighted towards any particular point in time, Exponential Moving Averages put greater emphasis on more recent data. Define: For example: A 10-day SMA is calculated by getting the closing price over the last ten days and dividing it by 10. 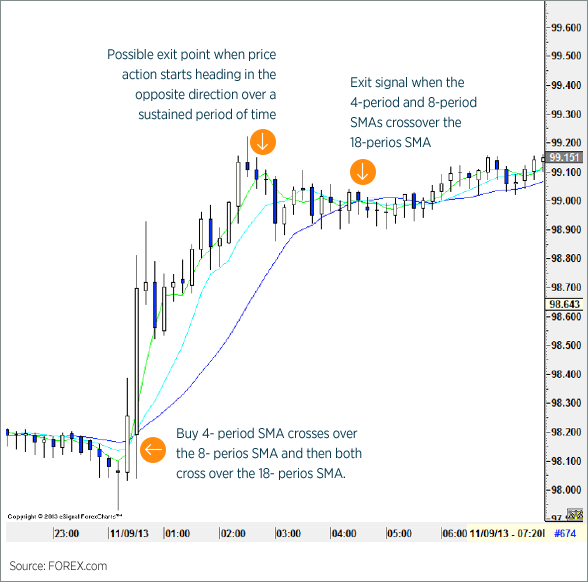 When plotted on a chart, the SMA appears as a line which approximately follows price action – the shorter the time period of the SMA, the closer it will follow price action. A popular trading strategy involves 4-period, 9-period and 18-period moving averages which helps to ascertain which direction the market is trending. We’ll focus on SMAs because they tend to indicate clearer signals and we’ll use it to determine entry and exit signals, as well as support and resistance levels. A buy/sell signal is given when the 4-period SMA crosses over the 9-period SMA AND they both then cross over the 18-period SMA. Generally, the sharper the push from all moving averages the stronger the buy/sell signal is, unless it is following a substantial move higher or lower. Hence, if price action is wandering sideways and the 4-period and 8-period SMAs just drift over the 18-period, then the buy/sell signal is weak, in which case we keep an eye on price to ensure it remains below/above the 18-period SMA. Whereas if the first two moving averages shoot above/below the 18-period SMA with a purpose, then the buy/sell signal is stronger (in this case a confirmation of a strong upward/downward trend can come from an aggressive push higher/lower from the 18-period SMA). Aggressive traders may enter the position if they see a strong crossover of the 4-period and the 9-period SMAs in anticipation of both crossing the 18-period SMA. We suggest ensuring that all moving averages are running in the direction of the break and that you keep a close eye on momentum. If momentum starts to dwindle early it can be an indication of a weak trend. You should be aware of the overall trend by using medium-term and long-term timeframes. If the market is trending in either direction, then you should be watchful of retracements in the opposite direction. 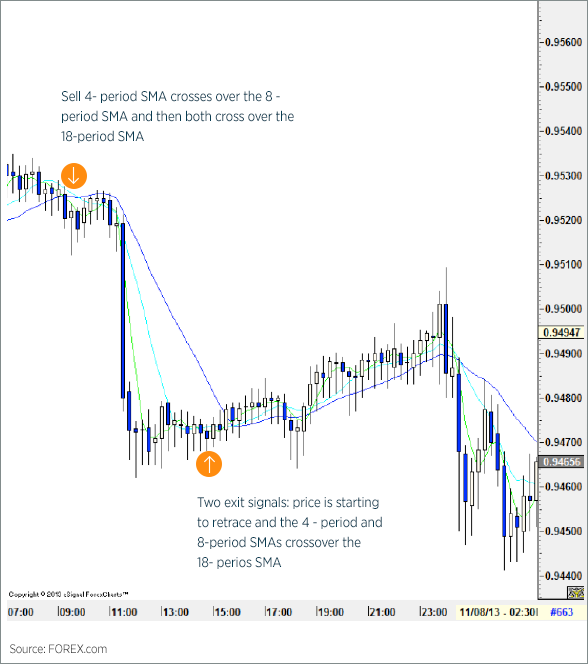 Sometimes price action can retrace sharply which causes the 4-period and 9-period SMAs to cross over the 18-period quickly, but because it’s a retracement and not part of the overall trend, price action can run out of steam fairly quickly. A trend that is losing momentum will become evident sooner in the short-term SMAs. This is where the strategy becomes more subjective - judge the strength of the trend and proceed accordingly. You can wait for the aforementioned moving averages to re-cross each other or you can use your own judgement to determine when to exit the position. In a strong trend you may choose to exit the trend when it starts to head in the wrong direction over a few time periods, as sharp pushes in either direction can be subject to retracements. In weak trends we suggest utilizing trailing stops. In any case, a big warning sign is when the 4-period and 9-period SMA cross back over the 18-period SMA, especially if the trade isn’t working out as planned. It may be a good time to get out to prevent possible further losses. Ideally a stop should be placed far enough away that it isn’t triggered prematurely but close enough to minimise losses. The goal of a stop is to attempt to protect you in case of a sharp spike in the wrong direction. In many cases the 4-period and 8-period SMAs will cross over the 18-period SMA before a stop is trigged, which should be an indicator to cut your losses. Notice that there is a strong push higher in price action after the crossover and then are a few opportunities to exit the trade. It’s also interesting to note that when the 4-period and 8-period SMAs cross back under the 18-period SMA it is a very un-interesting crossover (price action and the SMAs are very flat), so it wouldn’t entice us to get short. Look at short and multiple time frames; for instance, look at both the 10 and 15 minute charts simultaneously.